The first round of house matches was played on Friday after school in lovely weather. The matches were 8-a-side and featured a mixture of boys and girls from years 5 and 6. Each team batted for 12 overs: 4 pairs getting 3 overs each. Hitcham beat Bulstrode by 22 runs. In a high scoring match Mills beat Howard by 23 runs. As part of SPACE WEEK Mr Brook's activity was a Stop-go animation based on the moon. The children had to make some plasticine and lego models in front of a moonscape. They then had to take a series of digital photos following the movements of their models. The aim was to take about 200 pictures in order to create a story of over 20 seconds. The pictures were transfered to a computer. Using windows movie maker and some sound effects a short film was created. The finished film was saved as a media file. You can see some of the films below. They are great fun! This week has been devoted to SPACE. 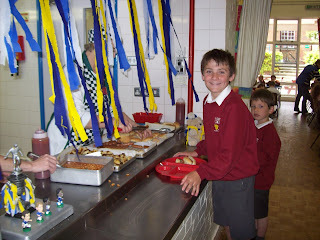 The whole school have taken part in a range of activities. 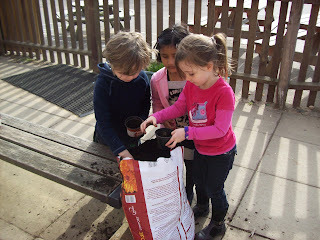 We have also had 3 exciting visitors in school. First of all we had the ASTRONOMY DOME, we then had QUANTOM THEATRE and finally we had a visiting STORY TELLER. 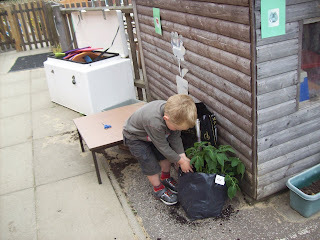 Watch the videos below to see some of the children's work. On Thursday 21st May our rugby squad travelled to Debenham for the annual rugby tournament. After a term of “after school” rugby, where house matches and inter school matches were held, hopes were high that our talented squad would wrestle the cup away from Debenham (winners for the previous nine years ). All three matches in the pool stages were won easily with Milo Dring excelling in the first match against Mellis with a quick fire hat-trick. The second match against St Botolphs was also a comfortable success while the final group game against Debenham B was more a close affair but ultimately skilful play from Charlie Smith and William Debenham brought the team home with a 3 tries to 1 victory. In the semi-final against Stonham Aspal, the team were severely tested for the first time in the tournament but the defence held firm and three good tries were scored before the final whistle. The team had earned their passage to the final where as expected their opponents would be Debenham. In a keenly contested final where both defences came out on top during long stretches of the game, the match swung in debenham`s favour with a controversial try being awarded to Debenham. Despite this setback, S.R.H. continued to press and only desperate defence from debenham held them out. The second half followed a similar path but Debenham stretched their lead when their speedy runners capitalised on loose play by S.R.H. on more than one occasion. But “heads never dropped” and S.R.H. were rewarded for their endeavours with two well worked tries by William Debenham and George Johnson. In all fairness, the final score of 5 tries to 2 in Debenham`s favour was not a true reflection of the closeness of the game. To lose to such a well drilled and skilful team was no disgrace and Mr Vaughan would like to congratulate and commend everyone for their efforts and good behaviour throughout the afternoon. The S.R.H. squad was as follows : William Debenham, Charlie Warren, Charlie Smith, George Johnson, Joe Humfrey, Guy Wilson, Milo Dring, Lucy Johnson, Amelia Garvey, Charlotte Matheson-Barr, Imogen Meynall-Anderson, Natalia Toogood. We are starting an art project with the help of an artist: Mrs Helen Evans (one of our parents). 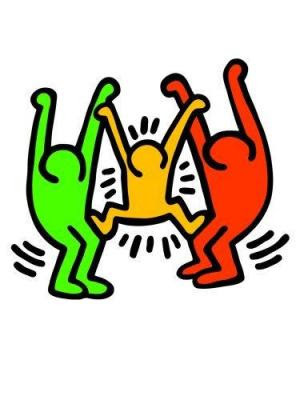 The aim is for every child in Key Stage 2 to produce a design inspired by Keith Harring. Everybody's picture will go on display in the school hall. Some of the designs will be chosen and recreated by our 'Gifted and Talented' Art Group on 3 wooden boards. These boards will then go on the wall in our inner courtyard. Harring liked to work quite quickly using bold lines, patterns and lots of colours. He painted on outside walls, buildings, schools and train stations. Many of his images and sculptures celebrate love, friendship and happiness. Some of his pictures give out message about life, freedom and peace. Hopefully the children will come up with designs which reflect school life. 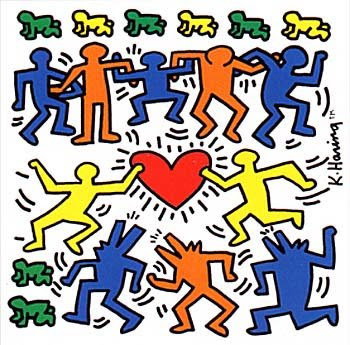 Follow this link to Keith Harring's website. 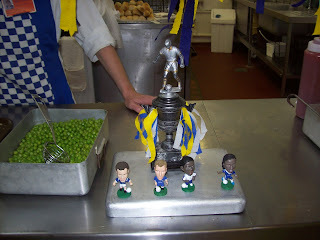 Our school kitchen put on a special lunch this week celebrating the Cup Final. 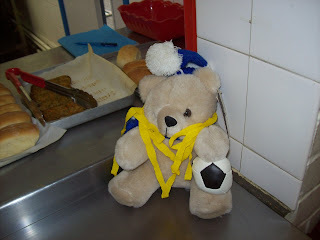 Trophies and bunting decorated the canteen in the colours of Everton and Chelsea. They will be playing in the FA Cup Final on Saturday 30th May at Wembley Stadium. Don’t forget this week is ‘Walk to school’ week. Please can we inform parents that chewing gum or bubblegum is not permitted in school. The local education authority are asking to be informed if any pupil, staff or family members have been to Mexico since the beginning of April. It is part of their process to identify potential location hot-spots. If your child or family members have been to Mexico please can you inform the office. Thank you. We are still short of helpers for swimming lessons which are due to start on Monday 1 June. If you are able to help with any of the following sessions please see the class teacher directly. Without enough helpers the children will be unable to use the pool. There are a number of websites aimed at children (including one called ‘mushi monsters’) which include FORUMS. A forum allows users of the site to exchange messages. This is obviously open to abuse from older children or even adults. Sites like this are blocked in school through our County Broadband filter. Our advice is that you need to be aware of the websites your children use and perhaps use the parental restriction facility that most home computers do have. We have found a pair of pale blue framed children’s glasses on the field. If you think they may belong to your child, please pop into the office to claim them. We are delighted to inform you that our Netball team won the area large Schools Netball tournament, We also had some excellent results in the inter-schools Cross Country – Boys Results: Adam Merry 3rd, William Debenham 4th, Charlie Smith 5th, Milo Dring 6th, Girls Results: Imogen Meynell-Anderson 6th, Charlotte Matheson-Barr 8th. Well done to all the year 6’s and year 5’s who took part. Don’t forget to visit the BLOG to see photos, reports and videos. Next week (25 May) is half term and the children return to school on Monday 1 June. Please remember to have swimming kit ready for the first week back after half term. There will be a meeting for children and parents where a complete kit list and itinerary will be issued. The only piece of specific camping equipment you will need is a sleeping bag. Mr Brook will show some photos & videos from previous trips to Whitwell and answer any questions you might have about the Year 6 camp. The date of the meeting is Wednesday 10th June in the school hall from 6.00 – 7.00pm. It is very important that the children have a sun hat whilst at camp. This year your child will be given a specially designed baseball hat as part of the cost of the trip. You can also order ‘Whitwell 2009’ T-shirts costing £5.00. If you would like to do so please fill in the form that your child has brought home and return with cash/cheque (payable to Framlingham Sir Robert Hitcham’s CEVAP) by Monday 9th June. 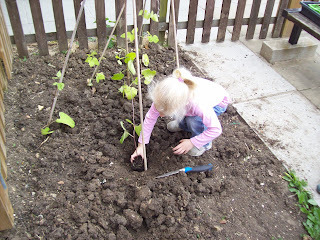 The vegetables planted by our Nursery children a few weeks ago are germinating (growing from seeds) well. 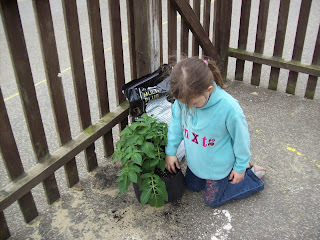 There are potatoes growing in plastic bags and runner beans up canes. The vegetables, when ready, will go to our school kitchen. Two men from 'Premier Sports' came into school to demonstrate some Playground Games to our Key Stage 2 children at breaktime. David and Freddy (from Class DB) took some photos and movies of the action. They have made a short film which you can see below. The pool has been cleaned and will be ready for use after half-term. We hope to start swimming on Monday 1 June – weather permitting. 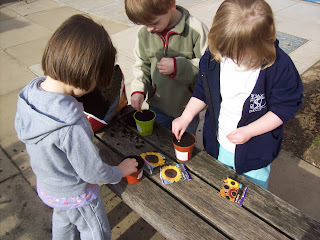 After discussion it has been decided that Nursery children will not participate in this activity. Classes GM, DB, RV and GH have decided not to use the school’s pool as they have done deep water swimming at Framlingham College. On Wednesday 6th May Class RV went for a trip round Framlingham for our history topic seeing old and modern buildings such as the Castle, Almshouses, Jefferson’s Well and the church. We were given questions to answer which extended our knowledge. First we walked along the road to see the Alms houses. We saw some roman numerals above the pump they were AD.MVCLIV. Then we went past the Church, We went up to look at the castle and saw the head at the back in the red bricks, we saw the Readery in Castle Street where the person who used to read the bible to people lived. We found out a lot about Framingham’s history. We found out that King Neptune’s head sits on top of Barclays bank, The Queens Head was originally used for bear handlers, The castle pond was used for drowning people who they thought were witches. Near the Market Hill we saw an old house. We could tell it was old because it had columns outside it. 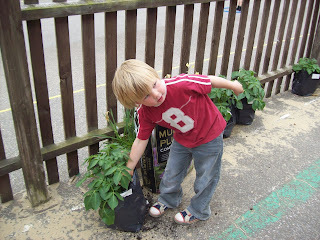 We loved our round Framlingham, we took lots of photos. Thank you Mr Vaughan and Mr Snowdon for taking us. • This item will not be relevant for children who come to school by bus. We are keen to promote the wider health benefits of keeping active whilst also providing better promotion of road safety and sustainable travel and so we would encourage all families to walk to school this week if at all possible. Perhaps those who normally drive into Framlingham could park on the outskirts of the town and walk in from there. SCC Road Safe team have prepared a suite of web pages on www.suffolkroadsafe.net that will provide activities, support and ideas for children, families and schools for that week. This is a high tech multi-media Planetarium Show which will be set up in the hall for the day. Classes will visit the 7.4m Planetarium in groups where they will have a presentation by a Fellow of the Royal Astronomical Society. The school will be paying for this, so there will be no charge to parents. PLEASE NOTE: Because the hall will be used all day for the planetarium we will not be able to provide hot dinners that day. 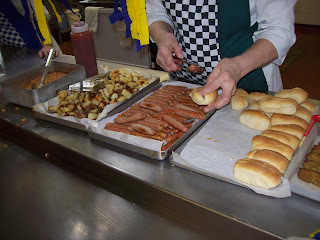 However Mrs Chapman is able to provide ‘packed’ lunches which will be based on a ‘Space’ theme – this will include a chicken bap (or vegetarian alternative), potato wedges, vegetable sticks, a biscuit and juice. 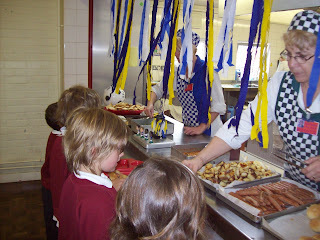 Parents may wish to purchase these, or provide their own packed lunch – children will be eating them in the classrooms. In the company of Galileo, Isaac Newton and Neil Armstrong they will be exploring day and night, the solar system, the moon and gravity. We would like to thank the Friends who are kindly paying for this performance so there will be no charge to parents. James Campbell, an experienced writer, storyteller and comedian will be with us to enthral the children with stories and stand-up comedy, with the focus on ‘Space’. The cost of this production is £315 therefore we would ask for a voluntary donation of £1.00 per child. According to the Governors’ Policy of Charges and Remissions for School Activities parents who are in receipt of: (a) Income Support; (b) Income Based Job Seekers Allowance; (c) Child Tax Credit and do not receive Working Tax Credit and who have an annual taxable income of less than £15,575; (d) Support under Part VI of the Immigration and Asylum Act 1999; or (e) a guaranteed element of State Pension Credit do not need to pay for this event. Nor will they be expected to make a voluntary contribution of money unless they wish to do so. Teachers will deal with the collection of money in the same sensitive way that operates for those children who receive free school meals. Please complete the form overleaf and return it to the class teacher by Friday 15 May. As the British weather is so unpredictable can we please ask that children bring a waterproof coat with them as we still like them to go out at breakl/lunch even if the weather is a little wet. Please can we remind parents/carers that children (both school children and siblings) should not be playing on the Trim Trail before or after school. We have been given some leaflets about the ‘Kevin Horlock School of Football’ on 27-29 May for boys and girls age 6-13. If your child is interested and did not get a leaflet/booking form from their teacher, please come and get one from the office. This is the second video in our series of Cricket Skills videos. This one features the most important batting techniques on the 'front foot'. These shots are played to balls that bounce / pitch close to the batter. A right handed player should move their left foot forwards before hitting the ball. A left handed player would move their right foot. Watch the video below to see / hear Alfie explain a whole range of front foot shots. Watch out over the next few weeks for skills videos on 'Back Foot Batting', Wicket Keeping and Fielding. We hope you learn something from these videos. Cricket is a very technical game so keep practising. Our Year 3 / 4 Maypole Dancers had their first performance of the season today. It is traditional to dance round the Maypole on the 1st day of May. Mrs Pascoe was delighted with how well the children coped with their first outing. The whole school came out to watch them on a glorious sunny afternoon. The Dancers have a busy schedule ahead of them with a long list of Summer fairs to which they are invited.